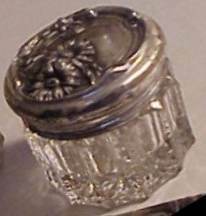 this vanity / dresser set consists of a couple of cut glass dresser jars with sterling silver lid and a brush with sterling silver cover. 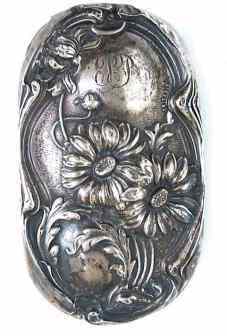 The silver is embossed in Art Nouveau style with floral motifs and a pair of great daisies. 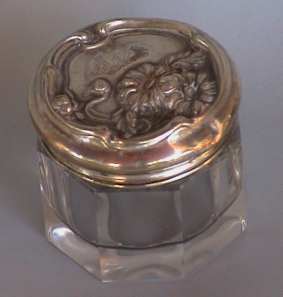 The lids have traces of gilding in the interior. 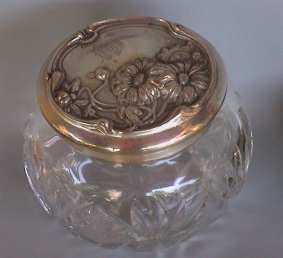 The jar's lids are monogrammed W and the brush is monogrammed PP . 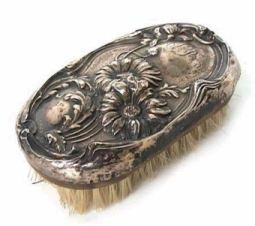 The set was made by Webster Company - North Attleboro - Massachusetts at the beginning of the 20th century. 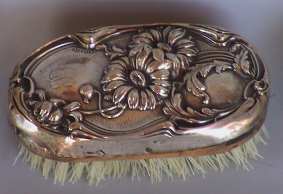 The jars were bought from an Italian dealer at an Antique Fair and the brush from a German dealer through the Internet.